At the beginning of this year I had the honour of working with Ngāti Whātua Ōrākei Trust through the Kāinga Tuatahi project, a 30-house village located on ancestral land at Bastion Point. The project has a strong emphasis on providing affordable housing for their tribe, while achieving stunning contemporary design and community. My role was to stage their first completed whare for their own portfolio. 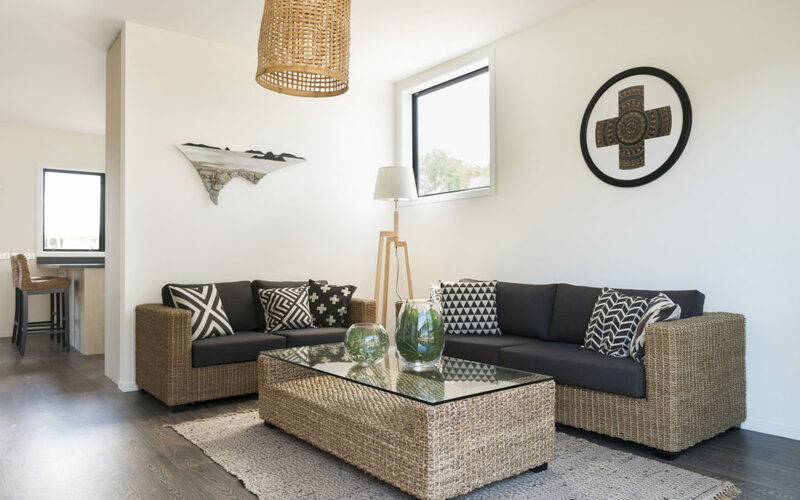 At first I didn’t put myself forward for this project, as I didn’t have the confidence to bring Maori elements into my interior design, it was a piece of art that gave me the inspiration to try. When travelling through Ohope I viewed a local art gallery, 4 Artsake. I discovered this stunning piece of art by Fiona Kerr Gedson, an artist from Ōpōtiki. Fiona was taught to weave as a child by local Maori women, you could see that Maori heritage through her piece and yet it is contemporary and stunningly creative. I witnessed how art could reflect the past while being on trend within the present. There is so much beauty in Maori culture and I wanted to challenge myself to do what Fiona had done within my expertise of home staging. I believe to furnish a home, you give it the ability to speak, to say to individuals things like “rest”, “play”, “relax”, “enjoy” and “connect”. For a project as significant as this one I hoped my work would say to Ngati Whatua Orakei and the new owners of this whare, “You are Home”.